Comfortably supports the lumbar and abdominal regions to help provide relief of lower back pain and discomfort during pregnancy. Made of a unique multi-layered soft laminate that proides excellent support and comfort with a soft cotton/nylon lining. Ventilated, latex-free elastic compression side panels provide compressive support. Abdominal lift attachment provides lift without undesirable pressure and can expand to accommodate growth during various stages of pregnancy. Lighweight flexible stays in the belt help keep the support in place and prevent rolling. Easy to wear under most clothing. Color: Beige. Size according to pre-pregnancy dress size. Provides gentle relief from reducible inguinal hernia. Removable foam compression pads give gentle, gradual pressure to help reduce inguinal hernias (single or double). 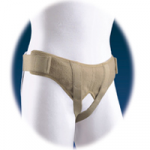 Lightweight material with a plush elastic waistband and soft elastic perineal straps. Completely adjustable without the use of uncomfortable metal snaps or buckles; simple hook and loop closure allows adjustability to control how tight the belt fits. Hides well under clothing. Color: Beige. Measure around waist. Provides exceptional abdominal support and offers relief from reducible, inguinal hernias by providing focused compression on the hernia. The brief features flexible, removable foam compression pads to treat either single or double hernias. Pad pockets are sewn into the brief and eliminate the need to wear both an undergarment and a truss. Adjustable compression straps may be easily adjusted for a comfortable, customized fit. Color: White. Measure around waist.